When it comes to our faces, we don't just rely on anyone to give us solid, skincare advice. We seek the help of experts like Dr. Aivee Teo, M.D. from The Aivee Institute. 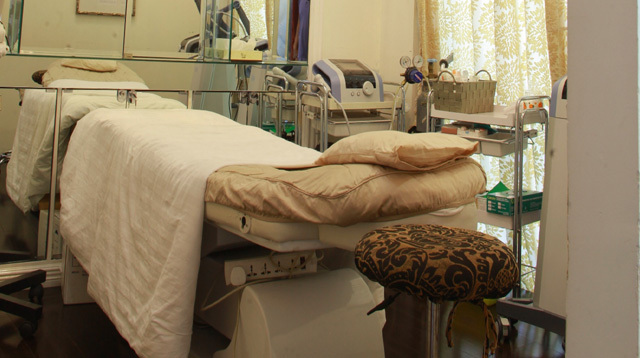 The celebrity dermatologist (you know why Kathryn Bernardo, Laureen Uy, and Kaye Abad have really good skin? Yeah, that's Dr. Aivee's doing) has exclusively brought the Excel V laser treatment to the country. The procedure—touted as the "Rolls-Royce" of all laser treatments—can treat spider veins on your legs, decrease the size of your pores, diminish your wrinkles, and remove pigmentation—all while boosting your body's collagen production. It's hard to believe one laser can do all of those, right? But this one can. Sure, it's a painless procedure. But you might feel a slight, tingling sensation on your face, especially in the areas where you have hair. The machine emits a weird, cracking sound as it grazes your face. (Ed's note: It actually sounded like there were a million tiny firewords exploding on my face, but it didn't hurt. I am terrifed of pain. TERRIFIED! So I asked the technician if she'd use numbing cream before starting. She said she didn't need do, and I didn't feel anything. I have low pain tolerance, so this is a big deal). The technician won't just glide the laser on your face. She picks certain spots—first your right cheek, then your left cheek; your forehead, your nose, and then your chin. That way, the laser can seep through the skin, and address your skin problems: blemishes, discoloration, and scars, included. You'll also smell like something's burning, and the technician will probably tell you to relax, because you'd think she'd set your face on fire. Nothing is on fire. Best part? There's absolutely zero downtime. (Ed's note: My cheeks were just slightly red after, but I didn't look puffy.) Plus, it only takes 30-45 minutes, perfect if you're considering doing this during your lunch break. The results are immediate. Your skin will feel so much tighter, you literally will not stop touching it. You're not allowed to wash your face for at least four hours, though. And you have to keep coming back once a month to reap long-lasting benefits. Should you get it? Absolutely. You know how you bump into artistas with no makeup at the mall, and you ask yourself, "How the f*ck did she get that glow? Is that possible? Is she from another planet?" Excel V really does make you look fresh, even without layers of makeup. So if your dream is to have poreless skin or to treat that stubborn pimple scar, you should make this a monthly thing...if you have P10,000 to spare. For further inquiries, visit the Aivee Institute at the 2/F East Bldg, Forbestown Center, Burgos Circle, Fort or call 02-4033245/0917 521 0222.